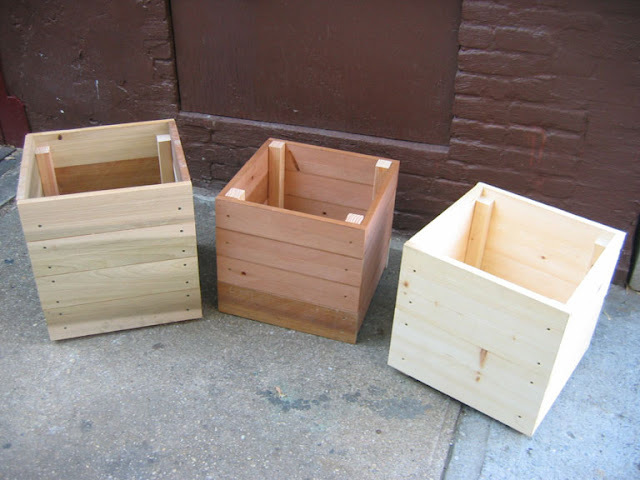 This is a very simple planter box originally shown on my blog NYCGARDEN many years ago. It's been shared on Pinterest so many times, I thought I should drop it here, too, in case you would like a basic tutorial. This box is a bit, um, rugged. 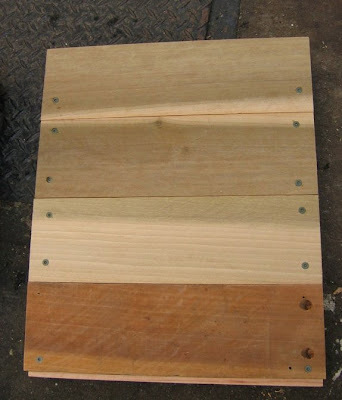 In the original post, I wanted to show how simple it can be to grab some scrap planks and make a quick box on your driveway or sidewalk -no shop needed. 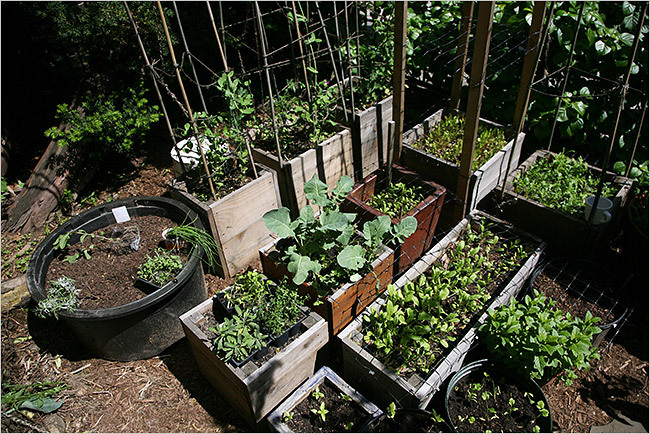 I used these boxes for several years, and the boxes even appeared in this New York Times article on urban gardening. 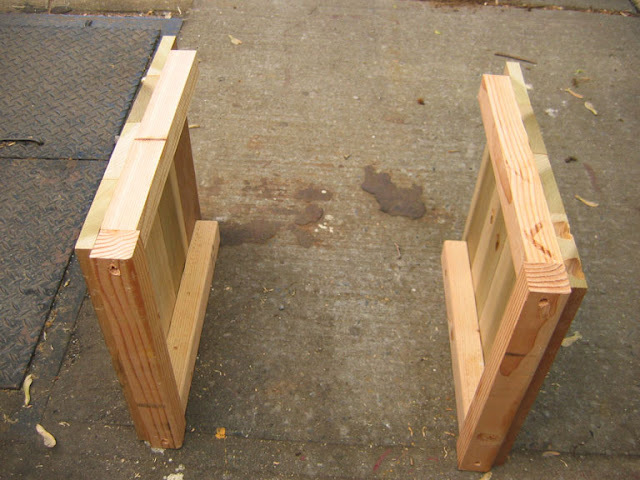 The basic ideas can be used with much better results by a) reading all the way through, b) using better lumber that can stand up to wet soil and weather, and c) possibly putting some feet on the bottom to keep if off the ground. Read on for my simple how-to. The box consists of two "U" shaped framing units with horizontal planks to tie the whole structure together. Wood plank and planter sizes can vary, so take my measurements as a rough guide. 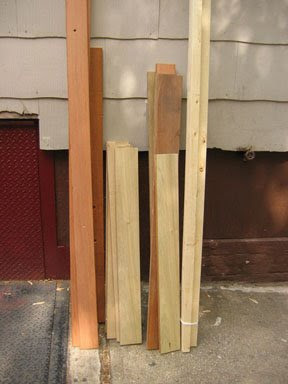 It all starts with some wood: scrap wood on the right, some bought pine on the left. 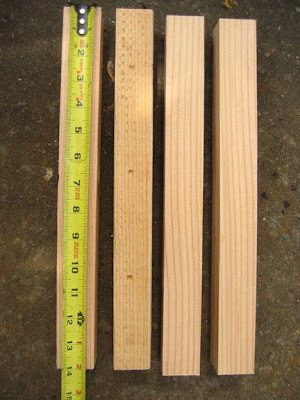 In addition to the planks, you'll need some 2x2 pine or cedar (better) for the interior framing. Of course, you'll need some tools. Tape Measure, pencil, drill, drill bits, chop saw or handsaw, and some 1-1/2 inch and 3 inch screws. 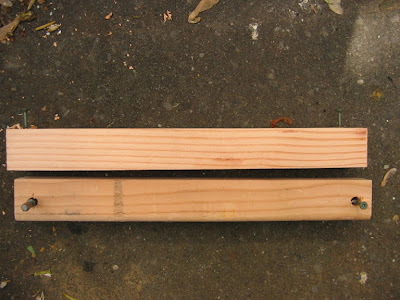 A carpenter's square is useful too, but not necessary unless you're using a handsaw. 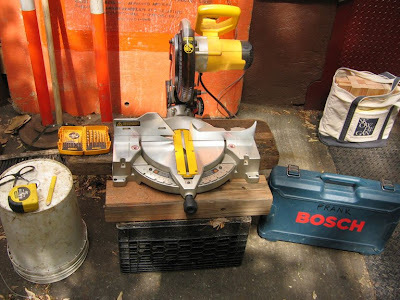 If you have an air compressor and nail gun, you can forgo the drill and screws altogether. Four 2 x 2 x 14 inch posts for the interior framing. 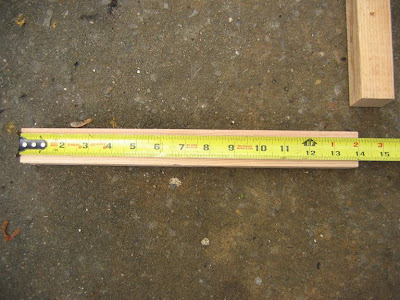 Measure and cut each at 14 inches long. 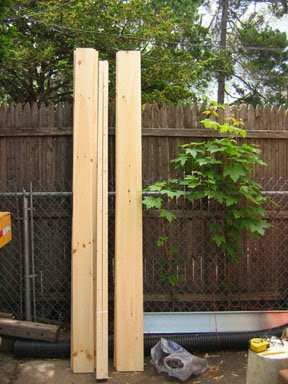 It is important that your cuts are square (90 degrees to the edge of the wood) so that the posts sit squarely in your box. Now take another piece of 2 x 2, measuring and marking it at 12 inches long. Cut. Repeat once. These two twelve-inch 2 x 2 pieces will become the bottom framing. Drill two pilot holes, about 3/4-inch from each end and centered. Then sink one 3 inch screw halfway into each of those holes. Afterward, line up two 14 inch posts in the fashion you see above. Lay this "U" on its side and drive two 3-inch screws through the bottom 2 x 2 and into the posts, making sure to keep the posts and bottom lined-up. One screw for each post. 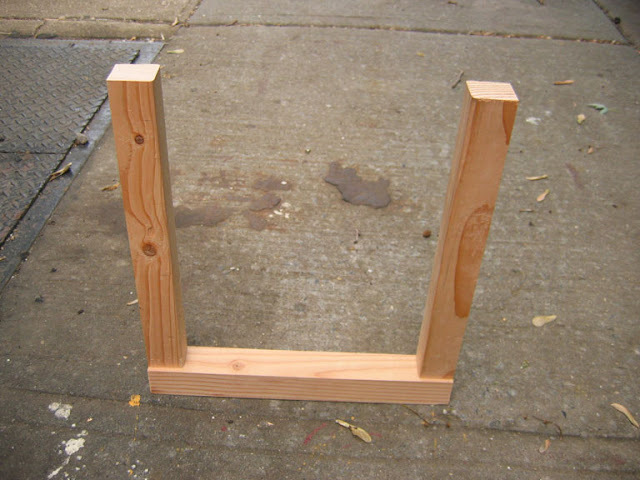 You will do this twice, one "U" shaped frame for each side of the planter box. Now you are ready for the plank sides. 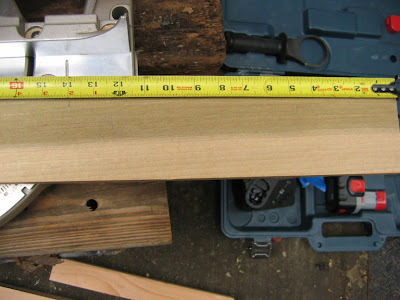 Take a plank, measure, mark, and cut it at 12-inches. The planks should fit exactly on the "U" shaped frame. My planks were about 3.5 inches wide, so that I needed four planks, laid side by side, to rise to the top of the 14 inch tall posts. Here I have four planks fitting nicely on the frame and an additional four planks for the opposite frame. Here you can see the edge of one of my planks. It has some holes, but none too big to interfere with its purpose. 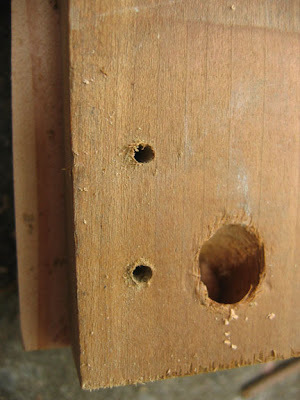 Drill a pilot hole (the small one near the edge) so that you don't split the plank when you drive a screw through it. Here you can see all four planks lined up with all pilot holes drilled. This image shows all the 1-1/2 inch screws driven through the planks and into the "U" shaped frame. Do this for the opposite side as well. 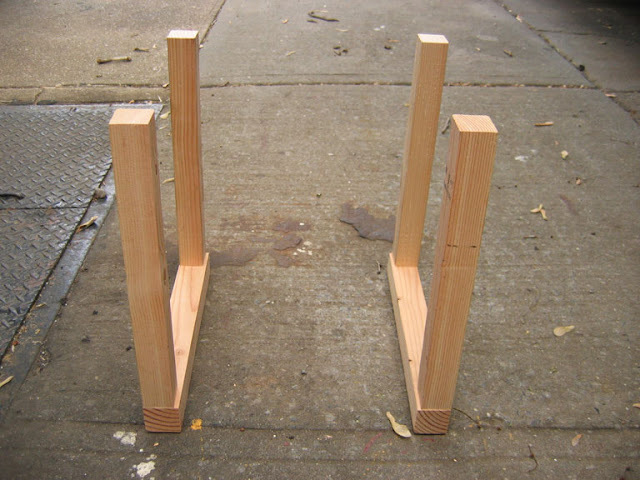 Both "U" shaped frames have been "planked." 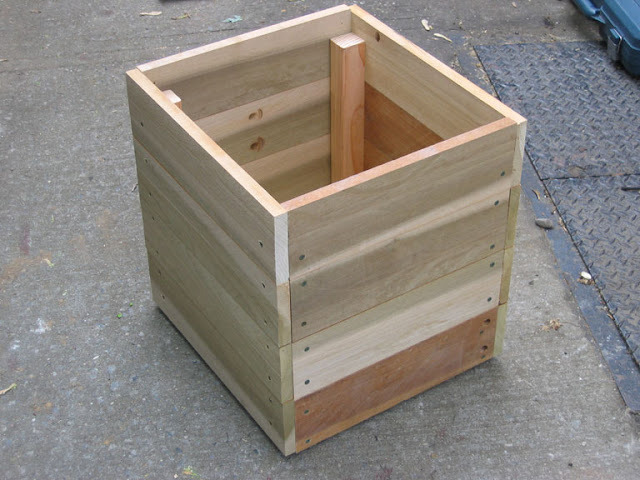 It is up to you to determine the ultimate size of your planter box. 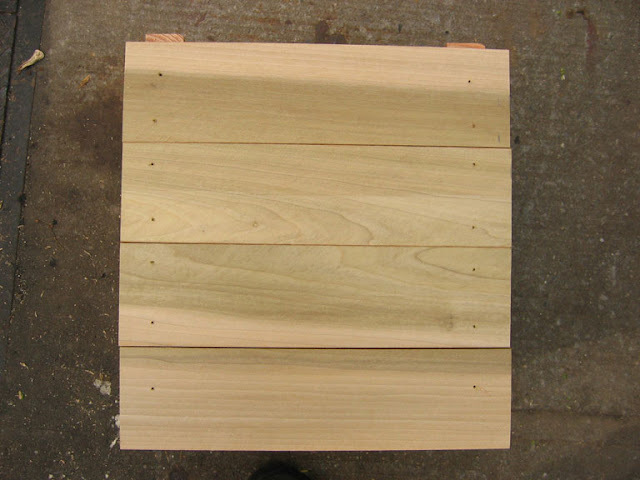 I decided that this box would have a rectilinear shape, 12 x 16 inches. Take the overlap of edges into consideration when determining your planter's dimensions. I measure another 8 planks at 16 inches long and cut each. 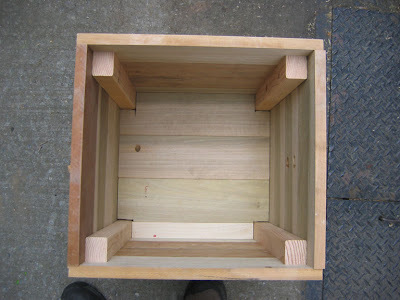 The interior dimension of this box will be 12 x 14-1/2 x 14 (L x W x H) inches. After drilling pilot holes in each plank, you line up the edges of each and sink a 1-1/2 inch screw into each pilot hole. 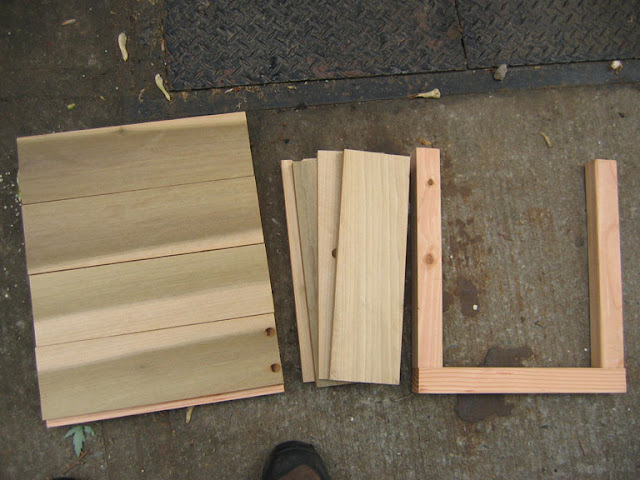 Do this for each of the eight planks and you should have a fairly substantial box. Now you need a bottom to your planter box. This is the most complicated part of the entire planter box building project. First, take a measurement of the bottom interior of the box. 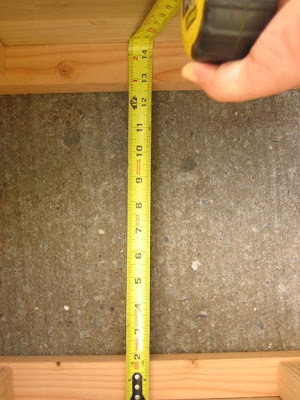 Make sure you are measuring across the bottom 2 x 2 framing as the bottom planks will rest on the ledge made by the 2 x 2's. I had different widths of scrap wood for the bottom, cutting all of them to length (14-1/2 inches). I put the bottom planks side by side, on the ledge, in the box. I then measured to make sure the needed remaining planks would fit. They did, so I cut the 2 x 2 post dimension (about 1-1/2 x 1-1/2 inches) out of the corners with my hand saw. I fit the cut planks in (you may have to tap it in) and then drilled drainage holes. Here's how it looks from the top with the bottom planks in, but before I drilled drainage holes. And here is the finished planter box. This is easiest, but scrappiest, box I could make. There are many ways to do it better in terms of fit and finish, but the basic building can be the same. An improvement on the box you see here would be to bring the posts all the way up to the top of the planks. You can see how my posts are a little short, disabling me from sinking a second screw in the upper row of planks. A second screw would help keep the wood from curling back when it gets wet. But I can accept this flaw. 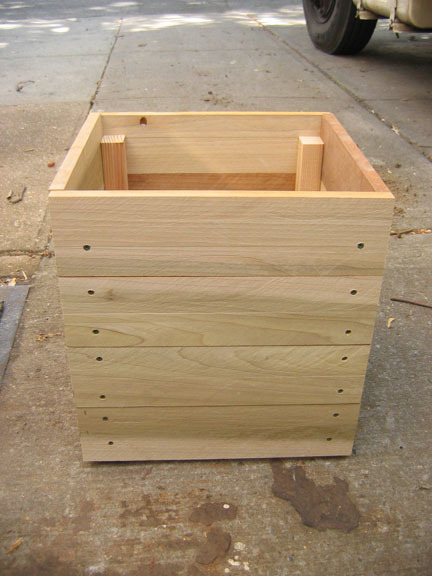 I was looking for functional, scrappy boxes made on the cheap (or mostly cheap). You can use cedar posts and planking for a longer-lasting planter, although avoid treated lumber (the greenish stuff) and ordinary plywood. 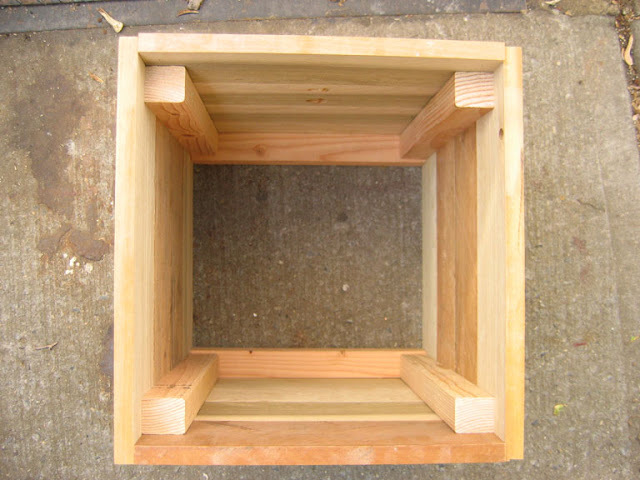 You can also plank your boxes vertically, although you will need to change the "U" shaped frame on each side to a square 2 x 2 frame, positioned on the bottom and top. Three finished planter boxes in poplar, redwood, and pine. Make the interior dimension wide (say 12 x 12 or so), but more importantly -make it deep so that the roots have room to spread out. The deeper the better for tomatoes. I filled my box with pure compost. But I also added some moisture-absorbing potting mix to the soil so that the planter box retains moisture (soil separated from the ground can dry out rapidly). My mixture was roughly 60% compost, 40% potting mix. Check often so that your vegetables aren't stressed by drying out.